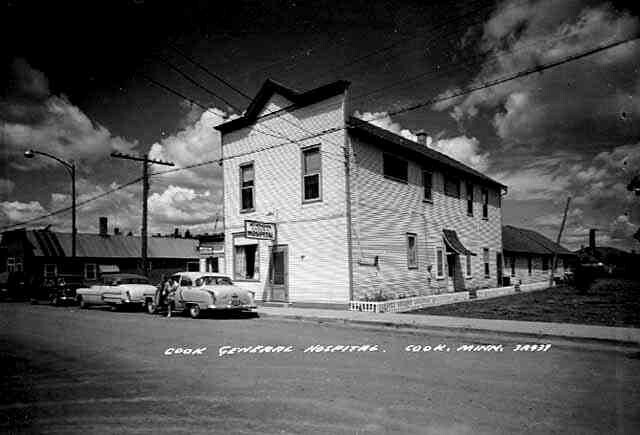 The Cook Community Hospital Association was established in March 1954 and the Cook Healthcare Auxiliary was founded thereafter as an organization to raise funds for the new hospital. In July 1955, Harry Enzmann sold Timber Days buttons as the first fundraiser to help support the hospital fund. 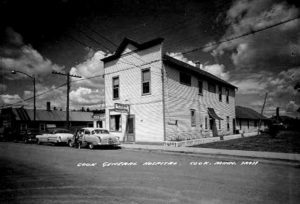 In 1957, the Auxiliary opened the Thrift Shop, completely operated by volunteers, selling second-hand goods to raise funds for the hospital. In October 1959, the Cook Hospital officially opened its doors with a 25-bed acute care facility. Dr. Heiam, along with other health care professionals, staffed the new hospital making the Cook Hospital a reality. The first administrator hired was Ms. Pearl Bradbury Ostlund, and her responsibilities were to oversee the finances, staffing, policies and procedures involved with managing a hospital. In 1963, Mr. John T. Snyder replaced Ms. Bradbury as administrator. In 1964, a 28-bed nursing home addition was built adjacent to the hospital and it included a pediatric ward. The W.C. Heiam Foundation was also established in 1964. Later in June 1969, Mr. Nick Riley took over as administrator. The 1970’s brought many challenges for the Cook Hospital from hiring a new administrator, to the temporary closing of the hospital, to staffing shortages, and to remodeling. Starting in 1971, Ms. Lineta Scott became the new administrator. In addition, an ongoing problem since inception was the challenge of obtaining and keeping qualified physicians. Finding physicians to staff the hospital became a challenge, and due to the lack of physicians willing to work in a remote part of northern Minnesota, the hospital was forced to close its doors in 1972. The year 1973 became a turning point for the hospital when Dr. Guido Schynoll began his employment with the facility allowing for the reopening of the hospital. In 1974, Dr. Harold D Johnston began his practice followed by Dr. Bruce D. Garbisch who opened his practice in October 1976. The hospital and the community are extremely grateful for these two physicians who are still a very imperative part of our medical staff today. Also in 1974, the hospital had downsized it bed occupancy to 14 beds by converting the other 13 beds to nursing home beds (41 nursing home beds total). In 1977, the Beauty Shop officially opened in the lower level of the facility providing haircuts and trims as well as perms and sets to the nursing home residents. The beauty shop volunteers provide beauty/hair care services one day a week and also provide social stimulation as well as tactile stimulation to the residents. Beginning in the late 1980’s the idea to formulate a hospital board began to develop some discussion among the community members. The creation of a board would allow for a broader representation of the area that the hospital serves, which would allow for more community involvement other than the City of Cook. One thought was to create a district that would allow for potential assistance from a broader regional area. As technology became the necessity to sustain a successful business, the City of Cook found it a challenge to uphold its financial abilities. In addition, the hospital had outgrown its structure and the community called for expanded services. Finally, in 1988, legislation was passed for the creation of a district. In 1989, Allen Vogt, who served as assistant administrator and acting administrator since 1986, became the new administrator. The 1990’s brought more changes with a new district formed, additional physicians, and new services added. The Cook-Orr Healthcare District was formed in early 1990. The District included several townships: Angora, Beatty, Field, Leiding, Linden Grove, Owens, and Willow Valley; the City of Cook and a few unorganized townships. Later, the following townships joined the District: Portage, Camp 5, Crane Lake and the City of Orr. Joining our elite medical team in 1990 was Dr. Joanne IntVeld. Further services were required to better serve trauma patients by installing a helipad in 1992, allowing for helicopter transportation to more advanced health care centers. Besides these changes, in 1995 the hospital set forth on a major construction project (New Horizons) to expand the outpatient services. This project resulted in the expansion of medical imaging, laboratory, physical therapy, occupational therapy and cardiac rehabilitation, and a new emergency room. “Still growing” is a term that can be used to describe the decade of the millennium. In 2000, the hospital undertook another construction project (District 2000), this one resulting in a new hospital entrance, a nursing home dining room addition, a redesigned dietary department, a computed tomography (CT) room, a redesigned medical records and business office, a new pharmacy as well as additional conference and meeting rooms. More construction was called for in 2005. A $5 million project (Portaging into a Healthy Future) consisted of a new hospital wing, a new and remodeled rehabilitation department, a minor surgical procedure area, an expanded laboratory and medical imaging and a nursing home multipurpose room. In 2006, MRI services became available at the hospital. In 2007, Dr. Albert P. Fleury, Internal Medicine joined the medical team. In 2008, the hospital website was created (www.cookhospital.org). The nursing home downsized to 33 beds in 2008. The 50th anniversary of the hospital “Where History and Vision Meet” was celebrated with great fanfare in 2009. The community turned out with wonderful enthusiasm celebrating the medical staff, care staff, emergency care personnel, and the fabulous volunteers and auxiliary men and women who work tirelessly in support of the hospital and nursing home. The coming year will have its own challenges but with it, the “Stars Among Us” will keep shining and be the backbone of continued strength and stability. Dr. Lynne Didrikson joined the medical team in June 2009 and in September, the hospital held its first annual Shake-A-Leg 5K Fun Walk/Run. In 2010, outpatient services expanded to offer colonoscopies and upper endoscopies at the hospital and later on added endocrinology services. The Veterans Administration opened an Outreach Clinic in the Cook Hospital. Orthopedic services were added to the outpatient department in 2011 and Wendy Long, CFNP joined Scenic Rivers. In 2012, Dr. Harold Johnston was honored for providing 20 years of service to Cook Hospital board. The latest construction project, “Spreading Our Wings” was completed in 2013 and led to a state of the art Emergency Room and outpatient services area, relocation of the hospital pharmacy and enhanced facility security. This newly completed project, in conjunction with the recently obtain Level IV Trauma designation, is a demonstration of the continued commitment the Cook Hospital and Board has to serve the needs of our community. The Mission Statement of the Cook Hospital clearly represents the blood, sweat and tears put into serving patients with the Highest Quality Primary Healthcare. MyRecord online medical records system was created in 2014 to provide patients with the most accurate, up-to-date electronic health record information. Doctors Matthew Holmes and Nicholas Vidor join the medical team. In 2015, Teresa Debevec took over as the new administrator having worked for the facility since May 1991. Kabetogama Township was added to the board (even though they were already in the district). ICARE Values were created. In 2016, Cook Nursing Home updated its name to Cook Care Center. Dr. Josie Norberg Lopez joined medical team and CFNP Emily Hadrava joined Scenic Rivers. Construction began on the Care Center, “Caring For Our Community” which is an $8.5 million construction project that adds 17,275 square feet of new space and remodels the remaining Care Center space. Today, the Cook Hospital is a 14-bed Critical Access Acute Care facility with an attached 28-bed Long Term Care facility that employs a professional staff of more than 140. The hospital is governed by a board of fifteen District members designated by the voters of each township and the cities of Cook and Orr. These members serve a rural/small town population of 10,253 and encompass a radius of 2,500 square miles. The hospital has a 24-hour emergency service, radiology, laboratory, pharmacy, physical therapy, occupational therapy, speech therapy and cardiac rehabilitation. Adjacent to the Cook Hospital is the Scenic Rivers Health Services medical clinic which provides five physicians and two certified nurse practitioners. The physician staff provides 24-hour emergency room coverage and inpatient services at the Cook Hospital. The service area of the Cook Hospital, including emergency services, encompasses Cook, Orr, Lake Vermilion, Kabetogama, Crane Lake, Tower, Nett Lake, south to Idington (close to Britt) and as far west as Togo. Basic Life Support ambulance units located in Cook, Orr, Tower and Nett Lake serve the hospital and ancillary services are also provided to the Scenic Rivers Clinic in Cook and Tower.